That makes a good rock song. 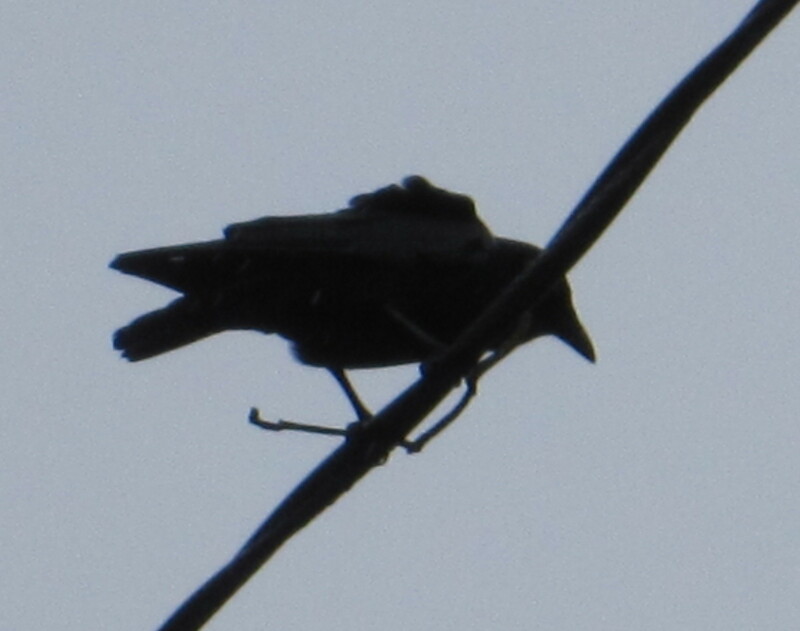 It has a good rhyme to it and pulls on the bad bird theme of Crows. Ok I digressed from my discussion today. 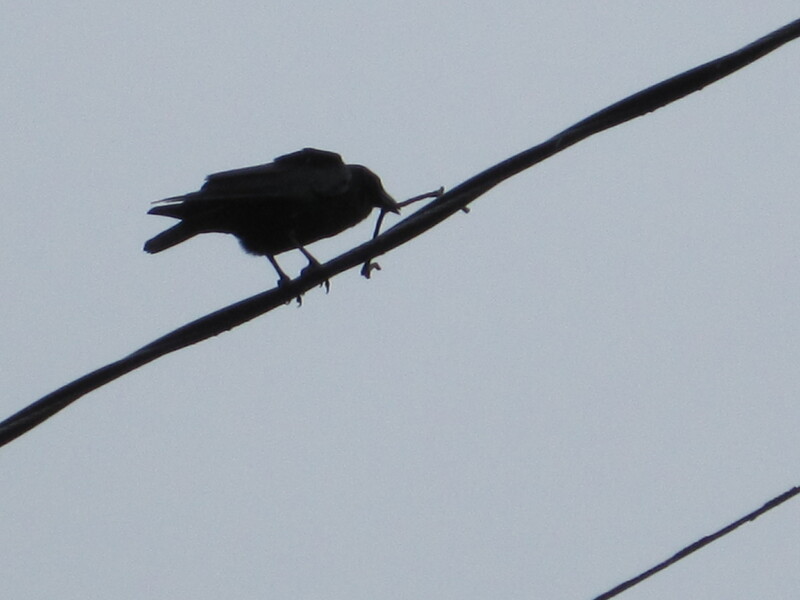 Its nest-building time for crows. Watch where they go with a stick in beak and you will find their new nest-building exercise underway. They prefer evergreen trees with a dense section of limbs high up but not at the very top. In this bushy area they will carefully arrange sticks for the base and form up the nice cubby hole where the babies can be contained for several weeks. Once they have the base built they will add moss, fur or any other soft material as a lining. Several years ago I saw a bird fussing with an old animal skin and found the nest he was building. Pretty funny when their beaks are full of fluff. First picture here is from Saturday when I was going to a garage sale. There the pair were in a driveway picking out the best sticks. Got a shot of one up on the wire being sneaky about showing me where they are actually building. Today I watched a guy on the wire manipulating his stick. He (She) flew in with the stick in beak. Then he moved it to his foot and turned it around to make sure it was suitable for his needs. Lets see will this one work? Next it was back in the beak for transport. Away he went and I found his tree home. The other way to find their trees is to watch the pairs fly in & out them. When they like one they will poke around and check out the interior of the tree. This is different than their usual roosting where they stay on limbs so they can see who is around them. Be aware that some nests never met the final inspection and are deserted before completion. I figure they didn’t have a strong enough structure to hold the precious cargo or they were discovered by an enemy of the crow. Maybe a seagull or a raptor spotted them working on it. Keep your eyes open and you will be able to watch for the next couple of months them raise a family. 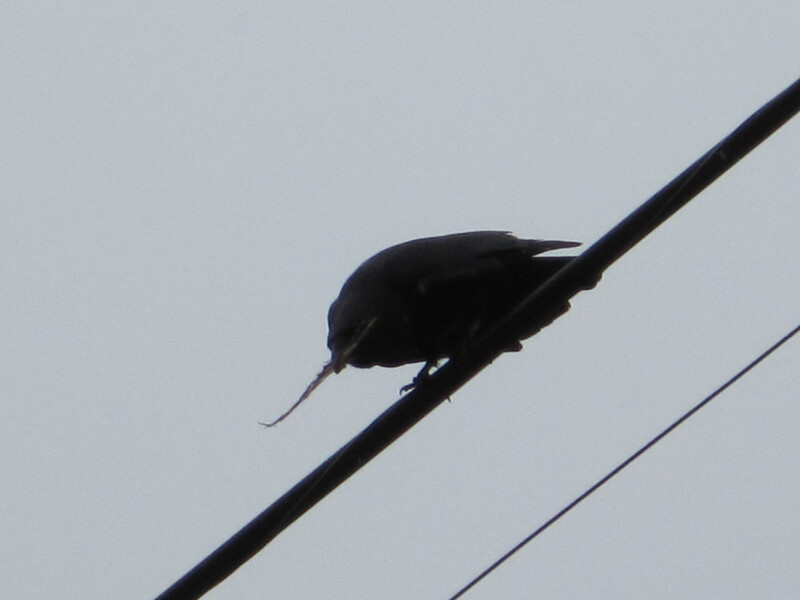 Then you can have the rare experience of actually seeing a baby crow. Their blue eyes and silly behaviour identify them.